I made my traditional corned beef and cabbage for St Patrick's Day yesterday. I received the following recipe in my email the other day and I knew it would be a winner for leftover corned beef. What else can you do with it besides hash or another sandwich. 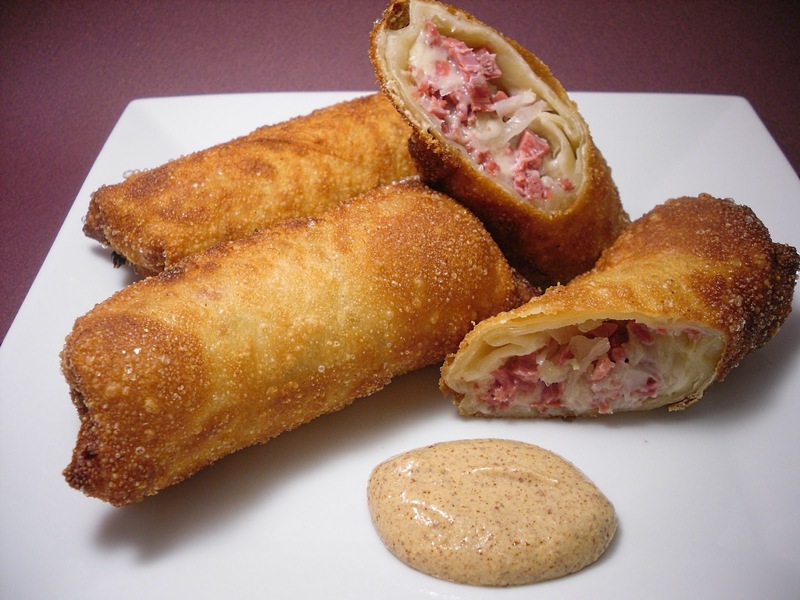 This also gave me some inspiration that you can put anything in an egg roll! How bout a mexican style egg roll with rice and beans and cheese or maybe even a stromboli egg roll! These make great appetizers or party snacks. In a medium bowl combine corned beef, cabbage, sauerkraut and swiss cheese. Mix lightly until combined. Heat your oil to about 350 degrees. While oil is heating, make the egg rolls. Lay one wrapper with the points facing you like a diamond. Brush with egg wash. Add another wrapper directly on top and brush again with egg wash. Place 3-4 tablespoons of the corned beef mixture on the wrapper closest to you. You can also add about 1 tsp. of the Thousand Island Dressing before closing up the egg rolls. Fold both sides over toward the middle and push down filling towards you. Begin to roll from the bottom to form egg roll. The egg wash will seal the egg roll. This should make about 8 egg rolls. Let egg rolls set for about ten minutes, covered with a damp paper towel. Carefully add about 4 egg rolls into the hot oil and fry for about 5-6 minutes or until golden brown. Remove and drain on paper towel. Serve with grainy mustard or Thousand Island dressing. Visit Miz Helen's Country Cottage on Full Plate Thursday! You should have posted these for St Patricks day. These look so yummy! These look awesome, Ive never made these. Where do you get eggroll wrappers from? Just a normal store? That's so yummy and perfect rolls! you have no idea how much I love Ruebens and this sounds like an amazing wrapped appetizer that I must have asap! love it! and they look fabulous! What a great idea! I just love a good Ruben and this is a great new way of presentation and looks delicious. Thanks for sharing with Full Plate Thursday and come back soon!